My engineering background gives him me unique insight into Council’s infrastructure issues and projects. I initiated the annual improvements on the footpath and drainage on Rosevears Drive and I lobbied for the RV friendly park at Biloo Street in Exeter. One of my first priorities was to have Council reduce its own energy use by instigating an annual energy audit. Changing to energy saving lamps. & many more - every year we save a little more. We are currently investigating installation of solar panels at our Windsor precinct. The audit identifies inefficient energy useage, enabling us to prioritise improvements. We will establish how much energy we use in various forms - fuel and electricity, for example. This will form the basis of our carbon footprint measurement, and allow us to set benchmarks for future improvement. ​I am also Council’s Taswater representative which has unique challenges. Besides these projects, I also apply my engineering expertise to building sandpits for my grandchildren. The on the ground changes in Legana are really exciting. It’s satisfying that having done the planning, Council is now taking action. Legana has grown quickly and has a busy shopping centre, but now it will also have great new community facilities. The rural parts of West Tamar have always had a really strong sense of community and it’s important that this is encouraged in Legana. I have liaised with the public in support of Rowella Hall and we eventually were able to save the hall which is now flourishing with events. I am part of many community committees such as ​ Tamar Valley Writers Festival, Farmgate Festival, Neighbourhood Watch, CORES (Community Response to Eliminating Suicide), Seniors Advisory Group and more. The recent council budget resulted is a small increase of around 2.6%. It's always a challenge to maintain services and keep the rate increases low. Councillors have their projects that they suggest as well a majority of requirements put forward by council managers for their respective areas. Starting the kerbing in Rosevears Drive. Start the new park in Exeter - see my blog for more details. RV friendly, electric car charging - and more! Council's purchasing policy requires we seek quotations, and I have recommended a procedure which ensures this process is easily and efficiently managed. This ensures that Council gets the best value for our ratepayers' dollar. A revised procedure has been approved by the Finance Unit and should receive endorsement at the May council meeting. Maybe not significant savings but ratepayers can be assured that their rates are being wisely spent. I have been a long time supporter of recycling. This includes supporting innovations in recycling, reducing waste and helping to implement systems that benefit us all. I have many examples of times I have liaised with stakeholders to understand the possibilities and limitations of what can be achieved and strive for the best possible results. 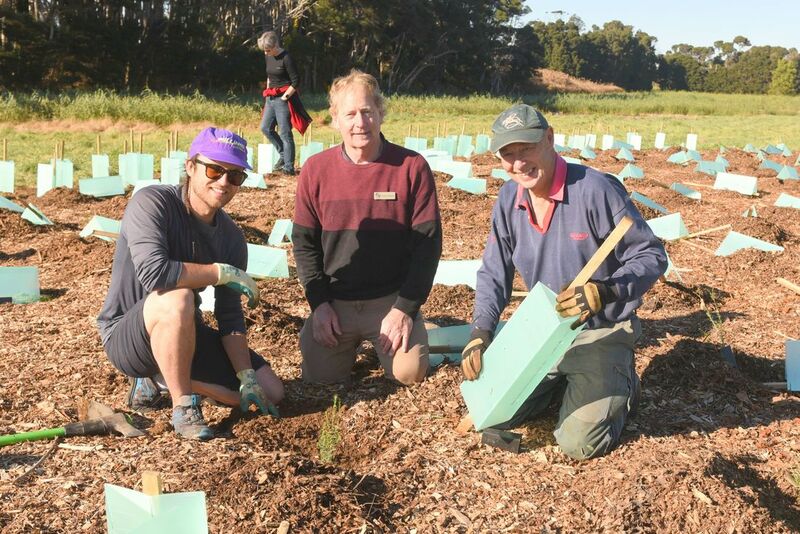 I am very proud of the implementation of Food Organics Garden Organics (FOGO) in July of 2018 by the West Tamar Council. The fortnightly, kerbside service is a convenient way for households to recycle food and garden organics with the potential to save on inconvenient trips to the tip and help by reducing landfill and greenhouse gas emission. Some of more thoughts on recycling. – I’ve often heard the story that our recycling just ends up as landfill so I thought I would investigate. Last week I had a tour of the Toxfree facility in Invermay and was very pleasantly surprised. Not that the facility is the most pleasant place – imagine a large shed with a mountain of recyclable material – front-end loaders lifting massive piles onto conveyors where a series of processes , some human operated , some automatic, sort our recycling into various categories. As fast as the pile is sorted another truck dumps more and the process continues – until something undesirable slips past the sorters, jams the machinery and everything grinds to a halt while the problem is fixed. Just because some of your “rubbish’ is made of a recyclable material doesn’t mean it can all be processed by kerbside collection – don’t put the old toaster in the bin – the conveyors at Toxfree can’t handle it – take it to the steel recycling bin at the waste transfer station. The average West Tamar resident recycles less than the national average – we could and must do better. Where does it all go to? Aluminium cans > NSW - don’t crush the cans please – the sorting equipment that detects the cans can’t cope with squashed ones. Tins cans > Victoria. It’s nicer for the operators if you’ve washed the cans but the recycling process burns off the contaminants. Empty paint tins are also OK.
Newspaper/paper and cardboard – this also goes to Victoria where it is reprocessed into paper and cardboard again. Glass also goes to the mainland but it is a very marginal product to process. Because it’s all mixed colours it cannot be re-melted and used as bottles so it generally gets crushed and used as an additive to road base or bricks. Small amounts of crushed glass can be added when making new bottles and this saves energy. Bottle banks, where bins are coded by glass colour, significantly increase the value of that glass as it can reused in bottles. At present there are very few of these bottle banks in Tasmania – maybe we need more. Plastic Milk bottles are made from HDPE (that’s a “2” in the recycle logo on the bottle) and these go to Hong Kong where they are often recycled into “plastic timber” – the new decking at Seaport was probably a milk bottle once. Clear soft drink bottles (PET) recycle code “1”– these go to NSW and are recycled, usually into polar fleece. All other plastics (codes 3, 4 & 5) can be sorted into different types for recycling. Most plastics can be re-melted and a portion of “used” material is added to virgin material before moulding. Nappies! Mothers please – green (or red lid) bin, imagine the mess these make through the sorting system. Food – just think of the smell you’re inflicting on the sorters. Clothes – if they’re any good take them to an op shop otherwise- green lid bin. Green waste – WTC, in conjunction with the northern region, are working on a green waste collection system but until then – compost or take it to the tip. Rope/cord/cable – plays havoc with the conveyor rollers. Oil – while I was there a 4 litre container of oil had split in a bin and consequently contaminated a whole truckload – which meant it all went to landfill. There are oil recycling stations at Exeter and Beaconsfield so please use them. Suicide, especially youth suicide, is a growing problem and urgently in need of our attention. I have been approached by CORES - Community Response to Eliminating Suicide, regarding the establishment of a group in the West Tamar, and this is now a flourishing group with regular meetings. I am committed to helping in any way possible and welcome any contributions or attendance from members of the community. Road kill is a blight on our roads, a confronting sight for many visitors to Tasmania, and is difficult to eliminate. I requested a report be prepared as a first step in examining what can be done to manage the issue. Council officers provide information and data including an appraisal of the current situation, and suggestions as to its management. A variety of methods are in use elsewhere, and this aim of this report is to identify our options. From Launceston to the Batman Hwy - requires twice weekly inspection and roadkill to be removed within 2 days of being identified. North of the Batman Hwy - requires weekly inspection and roadkill to be removed within 7 days of being identified.